Located on the seafront of Qawra limits of St Paul's bay, bang on the promenade, 7 minutes walk away from the national aquarium, the Cafe Del Mar Beach club, the Oracle Casino and a few minutes away from the Malta Bird Park. Brand new modern-finished STUDIO Penthouse, enjoying a large terrace with wonderful sea views, BBQ as well as garden furniture. Located just 150 metres off the Bugibba promenade. The apartment is air-conditioned and is located on the 7th floor of the apartment building. 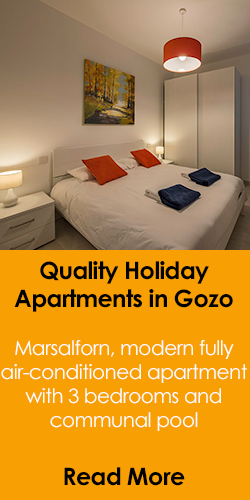 One bedroom holiday apartment located on the Qawra Seafront promenade. Apartment facilities include a flat screen TV with 90 free channels, free Wi-Fi, air conditioning, a washing machine and iron facilities. The sea is just a stone throw away from the apartment. WOW!!! Brand new modern-finished one bedroom PENTHOUSE apartment with terrace fully equipped with BBQ, outdoor furniture, sunbeds, and Hot Tub / Jacuzzi. Located just 150 meters off the Bugibba promenade. 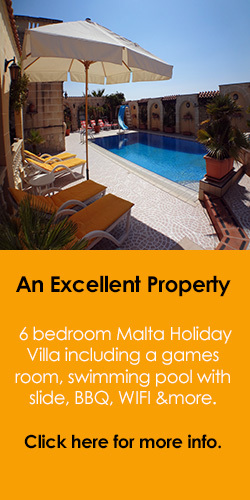 An ideal property for your holiday in Malta. Apartment with 3 bedrooms in Bugibba, accommodating from 2 to 8 persons, in 2 double beds and 4 single beds. The property enjoys an open plan kitchen, dining and living room area. within walking distance to shops, restaurants, bars, bus stops, and seafront. 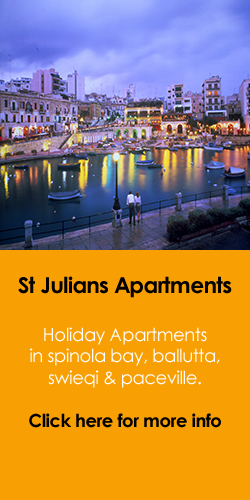 A bright & airy apartment in Bugibba (limits of St Paul's Bay) and ideal for holiday lets. Enjoying a large front terrace as well as a small back balcony, wi-fi, air conditioning and a lift. Close to the centre, a sandy beach, a bus stop, a bank, bars & several shops. 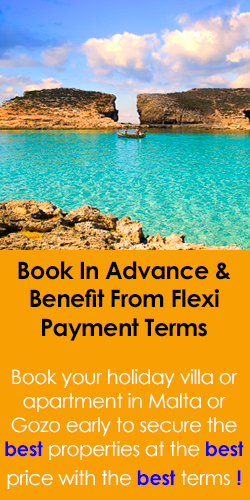 Forming part of a hotel resort, these one bedroom self catering apartments are centrally located in the popular seaside town of Bugibba, on the north-western tip of Malta and just a few minutes walk to the seaside, promenade, restaurants and bars. Two bedroom apartments in Bugibba offering spacious accommodation options for up to 5 people with an en-suite bathroom, separate living area and kitchenette facilities. air-conditioning, heating, satellite TV and telephone are all included. Standard one bedroom holiday apartments in Bugibba enjoying a balcony, private bathroom and a living/dining area with kitchenette and double sofa bed. Swimming Pool access. Within walking distance to the popular beach club of Cafe Del Mar. Standard one bedroom self catering air conditioned apartments located in Bugibba enjoying a balcony, private bathroom and a living/dining area with kitchenette and double sofa bed. Swimming Pool access. Within walking distance to the popular beach club of Cafe Del Mar. Low Cost Studio Apartments in Bugibba enjoying a private bath or shower, balcony, a TV, a kitchenette, and air conditioning. 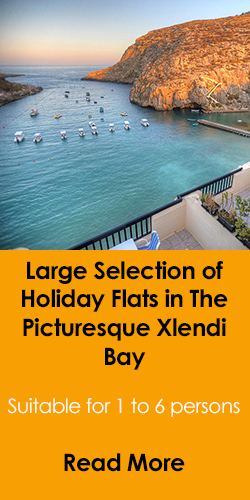 Excellent Low Rates for being in such a central area of this seaside resort and enjoying the use of a communal pool. Multiple studio apartments offering value for money accommodation in Buggiba. Ideally suited for 1 or 2 persons with a private balcony or patio, satellite TV, FREE WiFi, air conditioning and pool access. Accommodation in Bugibba in two bedroom hoiday apartments located a few minutes walk to the seaside & the centre of Bugibba. Each apartment enjoys a private balcony or patio, satellite TV, FREE WiFi, air conditioning & pool access. Acommodates a total of 5 persons. A modern and air-conditioned apartment close to the sea front in Bugibba. This holiday apartment is served with lift and enjoys lots of natural light. It is furnished with modern furniture and is fully air conditioned. Brand new charming 60 square meter apartment located just 140 mt from the promenade of Bugibba. The apartment is composed of 1 bedroom, one bathroom with shower, kitchen and dining area. It also has an extra sleeping area and can accommodate up to 8 people. This holiday apartment rental is located in Bugibba, Malta, with 3 bedrooms offering accommodation for 2 to 6 persons. Bugibba is a suburb of St Pauls bay and is situated next door to the seaside village of Qawra. Budget, Bugibba apartment rentals with use of a shared pool. 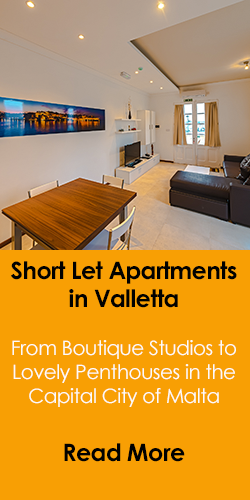 Multiple two bedroom units are available in this block of apartments providing Malta accommodation for up to four persons in each unit. Two bedroom Penthouse with sea views from terrace, close to the Bugibba's central square and to all amenities. This property is complimented with a lift, three air conditioners, WIFI, TV, two bedrooms and one bathroom. It can accommodate a total of 6-8 persons. Multiple studio apartment units set in a lively area of Bugibba, literally minutes away from the rocky beach, the seafront promenade, the bus terminus and the the main square of this popular sea side town. Bugibba one bedroom holiday apartment with air-conditioning and TV in all rooms, located in a quiet area, just 200 meters away from the promenade and near all conveniences of this lovely holiday village. Accommodates up to 3 persons. Bugibba 3 bedroom apartment for rent. The property enjoys a lift, AC, WIFI, TV, 3 bedrooms and 1 bathroom. The property can accommodate a total of 7 persons as there is the facility of putting up extra beds and there is a sofa bed. Available for rent is this 1 bedroom apartment with sea views. The property enjoys a lift, AC, WIFI, TV, 1 bedroom and 1 bathroom. The property can accommodate a total of 4 persons, as there is the facility of putting up extra beds and there is a sofa bed.